If you are new to genealogical research, you may wonder what is the Domesday Book. According to the Wiki on FamilySearch, the Domesday Book is a compilation of land records that were kept beginning in 1085 by William The Conqueror when he invaded England. This record contained information about the tenants and subtenants of the land England to be utilized in assessing taxes to support William The Conqueror. 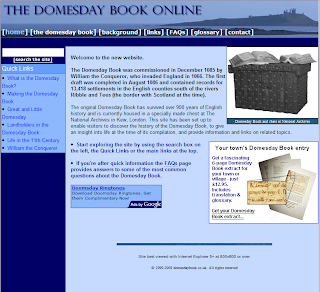 The reason that the information on this site is valuable to the genealogist and family historian is because "The Domesday Book provides extensive records of landholders, their tenants, the amount of land they owned, how many people occupied the land (villagers, smallholders, free men, slaves, etc. ), the amounts of woodland, meadow, animals, fish and ploughs on the land (if there were any) and other resources, any buildings present (churches, castles, mills, salt houses, etc. ), and the whole purpose of the survey - the value of the land and its assets, before the Norman Conquest, after it, and at the time of Domesday. Some entries also chronicle disputes over who held land, some mention customary dues that had to be paid to the king, and entries for major towns include records of traders and number of houses." The Domesday book contains approximately 13,418 localities. Th Domesday Book Online site provides you information regarding some of the major landholders and are in an extracted format on the website. You can view the major landholders by clicking Domesday Land Holders. This site will provide you information regarding the Domesday Books and provide historical information regarding the 11th century that will assist in your understanding on the times. Place name origins, a timeline, glossary and many other links are provided to enrich your knowledge and provide you with links to research. The information contained in the Domesday Book is available through the National Archives Domesday Documents Online. When you search in this database, you will be provided a brief summary of information which contains the major landholders in the region of your research. This condensed summary does not provide you with all of the tenants, subtenants, etc. so you might want to order the document. In order to view the document, it requires a payment by most major credit cards in order to view the document. In general, it appears that the cost of the documents is approximately 3.5 pounds. Please note that if you are paying from outside of the UK, you most likely will incur a conversion fee from the credit card as well. We are very fortunate to be able to view these old documents online from the comfort of our homes rather that paying for a trip to the UK, hotel rooms, etc. All in all I think that the rates that are reasonable; however, I would make sure you know the local that you are trying to research to avoid making the mistake of searching in the incorrect location. Have fun!